Fume hoods are an indispensable piece of equipment for the safety and integrity of laboratories. This safety device allows lab personnel the ability to conduct hazardous work in an enclosed space while protecting against explosions, spills, and the inhalation of harmful vapors. As air is moved from the fume hood through the ductwork, there are many factors that determine how harmful fumes are removed from the working area. One part of the fume hood that assists in controlling the airflow are the fume hood baffles. What is a fume hood baffle? Baffles are the movable partitions used to create slotted openings along the back of the hood. These slots and baffles direct the air that is being exhausted out of the hood. Visible from the working area, the baffles work in concert with the front sash to control airflow and optimize fume hood efficiency. When used properly, the baffles eliminate dead spots or possible reverse airflows at the sash opening which would result in a loss of containment. If the baffles are ever closed or blocked, the exhaust path is also blocked. Adjusting the baffles will allow the user to have a well-ventilated work surface. This also ensures that there is no turbulence from airflow disruptions. The adjustment process is not always simple and takes time to perfect. Someone familiar with the fume hood, its capabilities, and settings will be able to adjust the baffles with more ease than someone who is less familiar. Knowing the exhaust settings, sash settings, and materials in-use inside the hood all factor into the proper baffle setting. Often, baffles are adjusted based on the materials being vented. In particular, whether or not those materials are lighter or heavier than air. For example, when light vapors are in the fume hood, maximum airflow is required at the top of the hood. And the top slot should be fully open to ventilate the vapors out of the hood. When dense or heavy vapors are present, maximum airflow is required at the bottom near the work surface. And in this case, the top slot would be closed and the center and bottom slots are set to open. In instances where the work done inside a fume hood is replicated on a daily basis with little to no variation, baffles may be set and never adjusted. 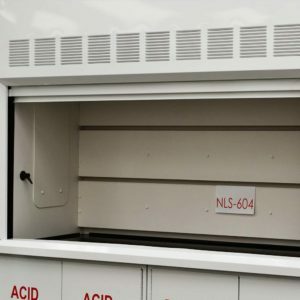 In these cases it is highly recommended to consult with a laboratory engineer to ensure that the fume hood baffles are set correctly, allowing the fume hood to function properly. Baffles play an important role in the overall operation of a fume hood. 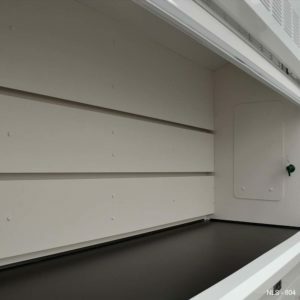 Familiarity with the fume hood, its capabilities, and the proper adjustment of the baffles will ensure optimal performance of the fume hood and protection for laboratory personnel.